Cheap Apple laptop deals: we’ve got the very best cheap MacBook Pro deals, Macbook deals and MacBook Air deals right here. Apple is known for many things, but affordability is not one of them. If Macs are your preferred choice of computing environment, you’ll generally need to dig deeper into your wallet than you would need to if you were buying a Windows laptop. The old style MacBook Air was officially upgraded in late 2018, and this was always the cheapest way to get an Apple laptop. It has been replaced by a much more up-to-date MacBook Air, which now comes with a Retina display and Thunderbolt 3 ports. The new MacBook Air is a fantastic laptop but it unfortunately costs more than the old one did. Apple still sells one model of old-style MacBook Air on its site, but it has a really dated internal specification that makes it very poor value for money compared with alternative options. If you’re looking to save money on an Apple laptop, we’d advise against this option. Instead, you can find better deals on the official refurb store where Apple sells its older models at a discount of up to 15%. They have new batteries and screens, so you won’t see any scratches, a year’s warranty, so they look as good as new. Stock availability varies, but it’s a great way to find some brilliant deals. And there are still plenty of great deals to be found on the latest hardware too. We’ve searched high and low to find the best cheap MacBook Pro deals, MacBook deals and MacBook Air deals – so if you’re in the market for a new Apple laptop then you’re in the right place. Our system checks the prices of every MacBook model at all major online retailers, so you can be sure that the deals you see here are the very best you’ll find. But if you’re not fully sold on a MacBook, take a look at our alternative laptop deals for some great prices on machines that won’t put you in the red. Until the recent 2018 refresh, the MacBook Air hadn’t been updated in years, languishing behind all of Apple’s other laptop models with an ugly screen and weedy performance from older internal hardware. That made it really affordable, but it was badly in need of modernising. The 2018 MacBook Air brings some of the sparkle back, reinvigorating Apple’s iconic design with an 8th-generation Core i5 processor, a 13-inch high-resolution Retina display, built-in touchID, a modern Force Touch trackpad, and two Thunderbolt 3 ports. It now comes in three colours - Space Grey, Gold and Silver, and retains the thin wedge design that Air has always been known for, giving it a very desirable look and feel. With a small 128GB SSD and 8GB of memory, the entry-level specification is fine for light computer use, but we’d absolutely recommend upgrading the storage to 256GB when purchasing to avoid running out of space later on. Apple’s MacBook is the thinnest, lightest, most portable laptop sold by the company, under 1cm thick and weighing less than 1kg. It doesn’t have any fans and runs completely silently, and can manage 10 hours of battery life, making it a brilliant light machine for working on the go, travel and carrying into meetings. They’re designed to draw as little power as possible, with a lower performance M3 CPU, so the MacBook is better suited for word processing and email than graphic design and video editing. Nevertheless it still looks the part on the outside, with a 12-inch Retina display and the same three Space Grey, Gold and Silver colours that the MacBook Air is available in. With the 2018 model, Apple has addressed a common criticism of its first-generation butterfly keyboards, making them more resilient against crumbs and dirt. And one nice point to mention is that the entry-level model has a generous 256GB of SSD storage, that helps make it better value for money, something of a rarity for Apple these days. If you look, the original MacBook Air is still available for sale on Apple’s website and is still the most affordable laptop Apple makes. But its lower retail price is something of a false economy, given that the old display has big, thick bezels around the display, has no Retina resolution, and uses ancient TN technology with poor viewing angles, compared with the superior IPS Retina screens found in every other Mac laptop. Worse, it has an old 5th-generation Intel dual-core processor, which may not be noticeably slower in day-to-day use for basic tasks such as email and web browsing, but is still years old. If you must have the cheapest Apple laptop going, then go ahead and get the older Air, but since you’re paying modern prices for old laptop technology, we’d still advise checking out our deals, eBay or the Apple refurb store, before buying direct from Apple’s main site. The MacBook Pro comes in three distinct flavours: 13-inch and 15-inch with the Touch Bar, and then another 13-inch model without the Touch Bar. If you’re unaware, the Touch Bar replaces the top set of physical function keys on most keyboards with touch sensitive buttons that change context depending on the application you’re using, although some have questioned how useful it is. But importantly, the 13-inch MacBook Pro models without the Touch Bar are better value for money, but less powerful than the variant that does have a Touch Bar. The 2018 MacBook Pro without the Touch Bar uses a 2.3GHz seventh-generation dual-core Intel processor, either a Core i5 or a Core i7, and the entry-level model is now priced in the same bracket as the MacBook Air and MacBook. 128GB of storage is standard, so again the advice is to choose more if your budget can stretch to it. And you get 8GB of DDR3 memory, which can be upgraded to 16GB. But once you start adding on extras to this entry-level MacBook Pro, the cost naturally skyrockets, which then makes the next tier up seem all the more attractive, given how it will offer significantly better all round performance for media editing and give you more storage anyway. We’d suggest that option if you can afford it - it’s simply better value if you’re after the best possible performance for your money. Apple’s cunning marketing team has very cleverly priced the 13-inch MacBook Pro with Touch Bar to make it much better relative value than an upgraded entry-level model. Crucially, it upgrades the seventh-generation Intel dual-core processor to a 2.3 GHz eighth-generation quad-core chip, which will make a massive difference in all media editing and design software, cutting rendering times by a whopping 50%. It has a few other neat extras too, with 256GB of SSD storage as standard, a True Tone display and more powerful Intel Iris Plus graphics, which will make a small improvement in some tasks. That makes its rather high asking price a tad easier to swallow. 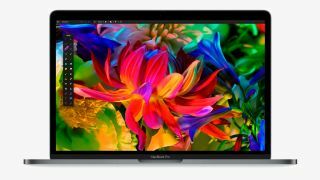 The 15-inch MacBook Pro will leave such a gaping hole in your wallet that it’s the last choice in terms of value for money on this list, but with the highest possible performance in any Mac laptop, this is what you really need for heavy-lifting in media editing and design software. The two available 15-inch models have 16GB of memory as standard, with six-core processors, starting with a 2.2GHz (4.1 GHz Turbo) Intel Core i7, with either 256GB or 512GB of SSD storage. This offers seriously fast performance that will go absolutely unused in day-to-day tasks like email, but will be brilliant for media work, with super fast exporting of video and plugins that just go like the clappers. Unlike the 13-inch model, the 15-inch MacBook Pro also comes with discrete AMD Radeon Pro graphics, with 4GB of dedicated video memory, and in November 2018, Apple is launching a further tier with even more powerful Radeon Pro Vega graphics. With this kind of performance in a laptop, the 15-inch MacBook Pro can replace your desktop completely, notably outperforming any of Apple’s current iMac lineup (which has not been updated since 2017). If you’re considering upgrading the storage, Apple offers up to 4TB, but this comes at such a high price that it’s much better value to stick to a more modest capacity and make use of a Thunderbolt external storage device. On the other hand, the memory upgrade to 32GB is definitely worth every penny if you’re looking at using the MacBook Pro for high-end media work. Why not upgrade your storage with a hard drive or SSD? See the best hard drive and SSD deals.